This is a brand new winder design from Orbita, and offers sleek, modern design with three winder heads using the Rotorwind® System. The original Avanti 3 has been redesigned to now include 3 built-in storage drawers for watches, pens and personal jewelry items. 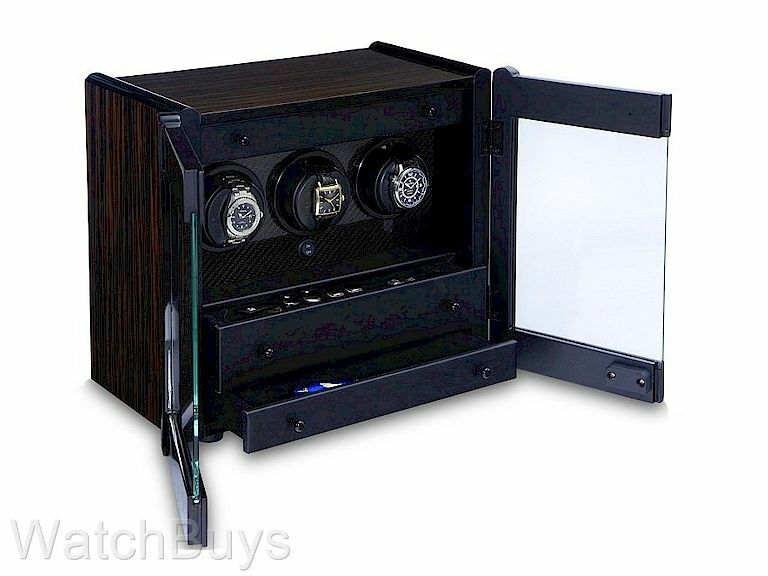 The case is constructed with fine Brazilian Rosewood veneers and with carbon-fiber trim panels. Two glass doors provide visibility and are lockable for security. Inside are three self programming winder modules powered by 5 year lithium batteries. The patented Rotorwind® system "rocks" the watch in an oscillating mode, once every ten minutes, 24/7. This gentle action replenishes the mainspring tension lost in the previous 10 minutes, assuring virtually constant mainspring torque. That is the optimum arrangement to insure the highest watch accuracy. Ball bearing construction throughout, coupled with the use of Swiss designed ironless core precision servomotors assures long life with no maintenance ever required. The Avanti 3 is the perfect choice for collectors whose watch collection is growing. 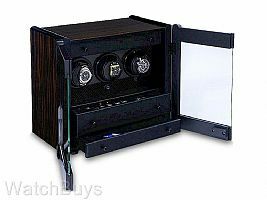 Unlike other watchwinders which rotate a watch in order to wind it, these unique watchwinders gently swing the watch instead. Every 10 minutes (standard program), the internal control microprocessor signals the drive motor to make a single turn, causing the watch to swing back and forth for several oscillations just as it would if it were being worn on the wrist. The 15-minute program (extended program) available on all battery operated versions allows many watches that wind in both directions to remain fully wound while on the winder, increasing battery life by as much as 50%. All battery operated Rotorwind® winders are fitted with high-energy, factory-installed, lithium batteries which are guaranteed to provide a minimum of 5-year battery life. In addition, each Rotorwind® winder carries an iron-clad 5-year product guarantee. The oscillating winding action of the Rotorwind® winder is totally self-regulating and there is absolutely no chance of damaging an expensive watch by over-winding. A semi-circular rotor, attached to the back of the mounting cup, is the "heart" of the patented Rotorwind® system. Made from a dense, non-magnetic iron material, it is supported by two free-turning precision ball bearings, thus enabling the heavy mass of the rotor to produce the "back and forth" motion when the cup is raised and then released from the 12 position. Each and every winder component has been designed and field-tested to insure long and trouble-free operation. Even the heaviest automatic wristwatch "swings" silently and effortlessly, supported by the oversized steel drive shaft, which is fitted with four low-friction, precision-groundball bearings.